The Tiny Touch board books series teaches concepts to little ones in a stimulating and interactive manner! 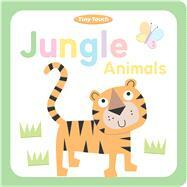 Little ones will love learning about jungle animals in this interactive board book! Embossed pages create a tactile experience for tiny hands. Max and Sid produce high quality cards with innovative designs. These are their first children's books.